Tongariro Northern Circuit Great Walk - Outside the Square. Tours for the "almost independent" Gay Traveller and their friends. Mountains, lakes, volcanoes, caves and geysers with a gay flavour in the evenings. This is a perfect custom trip for overseas visitors who want to hike the north island's most famous walk and have only a week. 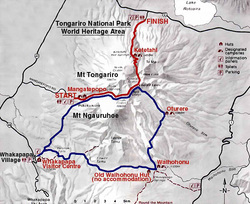 This 1 week 6 night adventure centred around the Tongariro Northern Circuit Great Walk packs a lot of punch. We drive from Auckland taking the west route and overnighting either at Waitomo caves or a gay owned farmstay (depending on group size and availability) there is a choice of taking a Waitomo cave tour or black water raft trip (not included) or heading to the wonderful waterfall and walk at Karamu before its on to Tongariro and our 3 day 2 night "Great Walk". Lightweight tramping food packs are provided for the hike with a stop on route down to the mountain to stock up on your favorite snacks. Weather is very changeable on the mountain and you will need to have all season clothing see DOC information. We return to Auckland after the walk, via Lake Taupo and stay 2 nights in Rotorua to explore this fantastic thermal wonderland again staying at a wonderful local gaystay. As with all of our "Great Walks" availability of the DOC huts means early booking essential. With this trip we have the option of splitting into 2 groups for the 3 hiking days, with one group doing day walks from the Chateau hotel inc the famous 1 day Tongariro crossing and the other group hiking around the mountain. So for those not keen to walk with heavy packs. 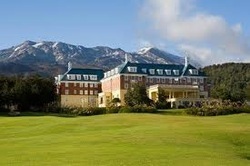 Add $250 NZD pp which will give you an extra 2 nights twin share at the Chateau (see below) from where you can day walk. Cost guideline please Enquire with group size and preferred dates. Chateau Tongariro our night of luxury on our return from 2 nights in the walk DOC huts. The walk can be done over 3 or 4 days we take three, which is fine for people of moderate fitness. Contact us if interested in the Tongariro trip.